Will The Big Switch shake up the energy market? Join the Which? campaign to get a better deal! By Richard Lloyd, Executive Director at Which? Until now, hard-pressed consumers have had to go it alone when they want to negotiate a better tariff with the energy giants. That is why Which? and online campaigners 38 Degrees launched The Big Switch, a completely new way to buy energy using the power of thousands of consumers to negotiate a market leading deal with suppliers. There has been an incredible response with more than 200,000 people joining together to get a better deal in less than a month. This unstoppable tide of public opinion shows the public demand for fairer, more affordable energy. People can sign up until the 31st March, and once we know how many are interested in switching, we will hold a ‘reverse auction’ where energy companies are invited to put forward their lowest price per kilowatt of electricity and cubic meter of gas. This is the first time this type of initiative on such a scale has ever been tried in the UK, but last year in the Netherlands the consumer organisation Consumentenbond successfully negotiated an energy deal for 20,000 consumers using this method which resulted an average saving of around €300 per person. It is no surprise that people are at the end of their tether with the energy market. Household bills continue to rise despite some energy suppliers announcing increased profits. And it’s no wonder that the level of consumer trust in energy companies is so low when people find it almost impossible to understand different tariffs and end up paying more than they need. Against a backdrop of poor complaints handling, bamboozling bills and tariffs that even energy sales staff struggle to understand, the suppliers now say they want to re-engage with their customers. The Big Switch is an opportunity for the companies to do just that when we ask them to take part. While it remains to be seen how well the suppliers will respond, our aim is to make sure that tens of thousands of consumers will save money from the resulting best bid. We’re asking people to give us more information about their current usage so that we can provide everyone with personalised savings estimates, and people can choose whether or not to switch. Thousands of people are joining in because they want to do more to influence the energy market than they can do alone. This new way of joining together to cut energy bills has clearly captured people's imagination. 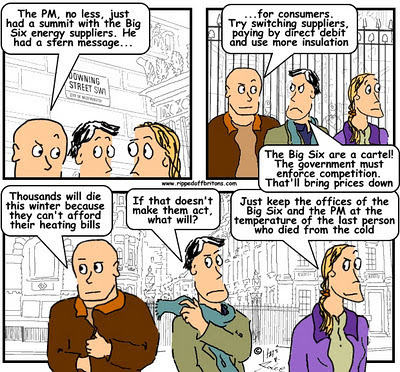 But with millions of people in the UK worried about paying their energy bills, we need more people to get involved. We are urging more people to get their family, friends and communities to sign up before the end of March. The more people that join together, the stronger our power when we are bargaining with the energy companies. Richard Lloyd, executive director at Which? People can register their interest using the The Big Switch website until the end of March. All they'll need to do this is to provide us with their name and email address. Once they've registered we'll contact them to find out more about their gas and electricity tariffs, so we can negotiate the best deal with suppliers.